While it is tempting to try to force children to behave in a certain way, these attempts often fail. Children realize that you are trying to control their behavior and may respond by doing just the opposite of what you'd like. Plan A increases the chances that your child will react poorly instead of complying. Commanding a child to do something often backfires. For example, if your child is refusing to take a jacket to school even though it's cold out, you may decide to let this go for now because you want to focus on the bigger issue of getting to school on time. Handling one issue at a time sets you up for success. Once one problem is solved, it's easier to solve the next one. Plan B takes the most time but also has the highest probability of success. When you use Plan B, you work with your child to find a solution to the problem. You are typically the one approaching your child to discuss the problem. You want to open up the discussion at a time when you and your child both have enough energy and the problem is not occurring. “The Empathy step involves gathering information from your child to understand her concern, perspective, or point of view on a given unsolved problem. The Define-Adult-Concerns step involves communicating your concern, perspective, or point of view on the same problem. One of the best things about Collaborative Proactive Solutions is that it stops you from making assumptions about why your child is acting a certain way. Instead you find out by asking your child about it and listening carefully. That’s the first step. You keep asking curiosity questions until you feel you completely understand your child’s point of view. In the second step you get to say your viewpoint on the problem. You explain why you are concerned and are taking the time to discuss it. Finally in the third step you and your child brainstorm possible solutions. When brainstorming do not judge the ideas – that will come later. If you say things like “that won’t work” or “how ridiculous” you’ll stop the ideas from flowing. You may want to write the ideas down so that you can reference them later. After you have all the ideas from both you and your child written down, circle the ones that meet both of your concerns. All the circled ideas are possible solutions. Let your child decide which one to try first. It’s helpful to set up a time to meet again to check in on how the solution is working. You may find there needs to be some tweaks to the original solution. Or you may see the chosen solution is flawed and your child may want to choose a different solution from the circled ideas. Dr. Greene’s site, Lives In The Balance, contains a Plan B Cheat Sheet which provides ideas for handling each of the three steps. 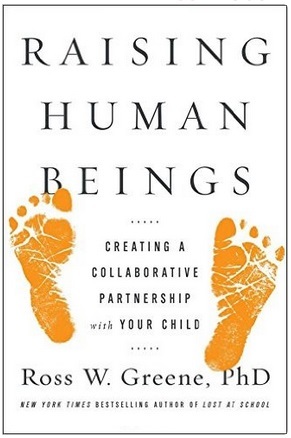 For even more information, you can read his book Raising Human Beings. Using the Collaborative & Proactive Solutions approach does take time. However, solving a problem behavior once and for all makes it worth the effort!